Last weekend I attend the North Country Fair. As I approached the entrance, there were signs stating, “This is a zero waste event.” I became curious. Just what exactly does zero waste mean? 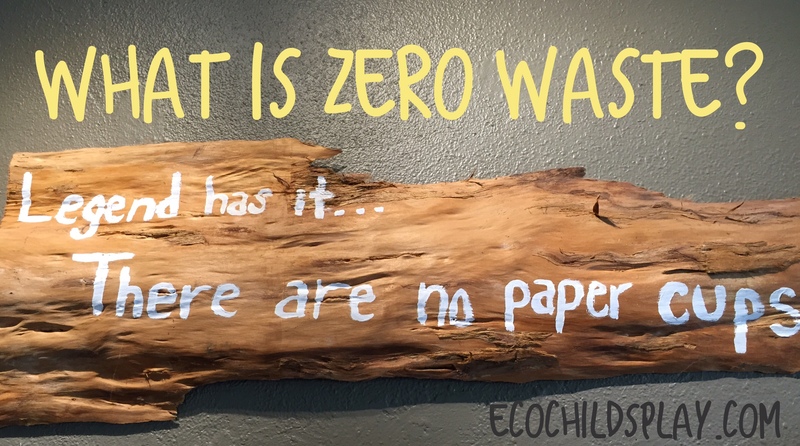 Without doing any research, I assumed zero waste meant exactly what it says…zero waste. Everything that is disposable is recycled or composted. No landfill trash. No trash cans. The term zero waste is trending and a goal of many green-minded corporations and events. Is truly possible to have absolutely zero waste? At the fair, we purchased food from a vendor. The cutlery was wooden; the plastic cups and paper plates were compostable. When I went to dispose of our food containers, there was a woman tending the cans to make sure everyone put the right items in the right spot for composting and recycling. We had one small piece of plastic wrap that had covered my son’s fruit salad. That went into the trash can…..What? A trash can? Zero waste models are cyclical instead of one way. 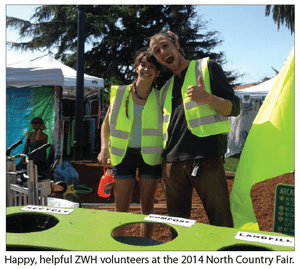 According to the Grassroots Recycling Network, it “aims to eliminate rather than manage waste”.2)http://www.grrn.org/page/what-zero-waste Clearly vendors the fair had made choices to eliminate almost all of the waste. Earlier this month, I traveled to Kennebunkport, Maine to visit Tom’s of Maine. Tom’s set a goal of zero waste by the year 2020, but they have amazingly reached that goal for 2015. When we toured the factory in Sanford factory, we had to wear ear plugs and hair nets. At the end of the tour, there were recycling/upcycling boxes for visitors and employees. My ear plugs came in a small plastic bag. I watched other visitors discard this bit of plastic in a trash can….what a trash can? Again, I was confronted with a trash can when zero waste is the goal. When I asked what to do with my small bit of plastic packaging, a Tom’s employee took my plastic and said he would take care of it. We stick to waste principles — reduce, reuse, recycle, upcycle in all we do, including our work with our supply partners. For example, the process of packaging our deodorant revealed a new use for plastic waste. As one Tom’s employee shared on my recent trip, you can’t control what the consumer does when it discards your product container, but you can make it easy for them to find a better solution than the landfill. Communities and companies share this responsibility. Waste prevention through product design spearheads the problem of post-consumer responsibility. For example, our local coffee shop offers no paper cups. They have loaner mugs, you can buy a reusable one, or you have to remember to bring your own. What will you do with your next empty shampoo bottle or milk carton? At best, you will recycle them, thinking you’ve done your part in saving the planet. But followers of the increasingly-popular Zero Waste lifestyle disagree: recycling is only the final step, they say. First we need to reduce and reuse. When the world’s first package-free supermarket opened in Berlin a year ago, it attracted global interest as a new green initiative: instead of selling pre-packaged items, all produce – pasta, beans, flour, oils and vinegars – is offered in large bins with dispensers, and buyers are expected to bring their own containers or purchase reusable ones on site. As the original “Unverpackt” (unpacked, in German) marks its first birthday, it’s already seen as part of a movement. It amazes me when companies like Tom’s of Maine and large community festivals like the North Country Fair achieve zero waste goals. It is a goal we should embrace in our own homes. As consumers, we should make choices with waste in mind. Does less than 10% of your family’s discards end up in the landfill? Supporting companies and businesses embracing zero waste goals is one place to begin bringing zero waste into your home. If companies and festivals can do it, so can we! « Are there any benefits to taking vitamins and supplements? My colleagues and I strictly cling to the 5 Rs rule. It is essential to try our best to reduce the footprint of our existence in the name of the greater good. But that is achievable only when everyone starts thinking, not just consuming! Zero waste environment is still a mirage, but every effort we make is a step closer to our goal!